Codependency has been referred to as “relationship addiction” or “love addiction.” The focus on others helps to alleviate our pain and inner emptiness, but in ignoring ourselves, it only grows. This habit becomes a circular, self-perpetuating system that takes on a life of its own. Our thinking becomes obsessive, and our behavior can be compulsive, despite adverse consequences. Examples might be calling a partner or ex we know we shouldn’t, putting ourselves or values at risk to accommodate someone, or snooping out of jealousy or fear. This is why codependency has been referred to as an addiction. In 1956, it decided that addiction was a disease, and in 2013 also named obesity a disease. A prime motivation in both cases was to de-stigmatize these conditions and encourage treatment. In 1988, psychiatrist Timmen Cermak suggested that codependency is a disease noting the addictive process. Psychiatrist and doctor of internal medicine, Charles Whitfield, described codependence as a chronic and progressive disease of “lost-selfhood” with recognizable, treatable symptoms — just like chemical dependence. I agree with Dr. Whitfield, and in Codependency for Dummies refer to codependency as a disease of a lost self. In recovery, we recover our selves. 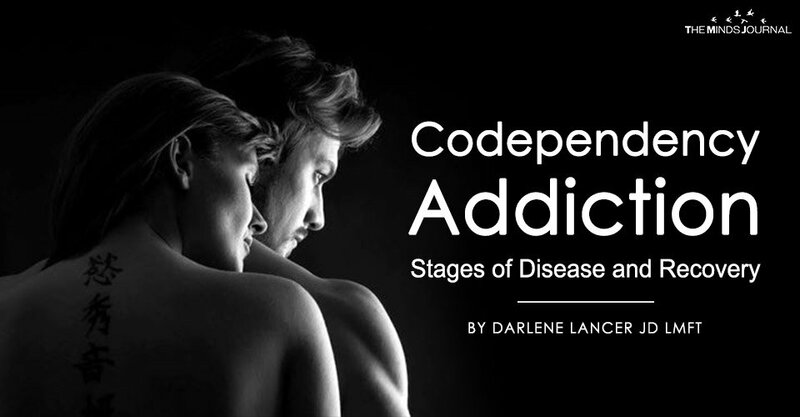 Codependency is also characterized by symptoms that vary on a continuum similar to those associated with drug addiction. They range from mild to severe and include dependency, denial, dysfunctional emotional responses, craving and reward (through interaction with another person), and inability to control or abstain from compulsive behavior without treatment. You increasingly spend time thinking about, being with, and/or trying to control another person, just as a drug addict with a drug. Other social, recreational, or work activities suffer as a result. Finally, you might continue your behavior and/or the relationship, despite persistent or recurring social or interpersonal problems it creates. Codependency is chronic with enduring symptoms that are also progressive, meaning that they worsen over time without intervention and treatment. In my opinion codependency begins in childhood due to a dysfunctional family environment. But children are naturally dependent, it cannot be diagnosed until adulthood, and generally begins to manifest in close relationships. There are three identifiable stages leading to increasing dependence on the person or relationship and corresponding loss of self-focus and self-care. The early stage might look like any romantic relationship with increased attention and dependency on your partner and desire to please him or her. However, with codependency, we can become obsessed with the person, deny or rationalize problematic behavior, doubt our perceptions, fail to maintain healthy boundaries, and give up our own friends and activities. Gradually, there’s the increased effort required to minimize painful aspects of the relationship, and anxiety, guilt, and self-blame set in. Over time, our self-esteem lessens as we compromise more of ourselves to maintain the relationship. Anger, disappointment, and resentment grow. Meanwhile, we enable or try to change our partner through compliance, manipulation, nagging, or blaming. We might hide problems and withdraw from family and friends. There may or may not be abuse or violence, but our mood worsens, and obsession, dependence, and conflict, withdrawal, or compliance increase. We might use other addictive behaviors to cope, such as eating, dieting, shopping, working, or abusing substances.